One of many bromides being put out by cheerleaders for Obama. Maybe Obama supporters shouldn’t do a victory lap until Inauguration Day 2017. After the last State of the Union address by our Nobel Peace Laureate, bromide/memes like the above circulated freely on the Internets. This one was at least smart enough to leave lower gas prices off the list. You probably shouldn’t draw people’s attention to the fact that oil prices have fallen off a cliff because export and manufacturing activity has fallen off a cliff. They’ve also left off the Dow, which is now in correction territory. The Dow is tanking mainly because nobody’s buying anything, and the Dow is also tanking because China (now the world’s second biggest economy) is melting down. And China is melting down because nobody has discretionary income to buy plastic crap that China manufactures so well. As for those 14 million jobs, I’ve got one of them and I need another two of them to cover my bills or come close to what I was earning in the fall of 2008. At least 40% of the jobs created after the 2008 crash are part time jobs with no benefits and limited chances to go full-time. Also (as I’ve argued on this blog), the ACA and ‘Obamacare’ has reduced the number of people going without medical insurance. However, insurance has changed in big ways since passage of the ACA–people have more deductibles, services cost more, and insurance companies have raised rates at a faster clip than in previous years. One of the things I would fault Democrats (especially Obama fans) for is assuming that medical insurance is interchangeable with purchasing medical care. People might be insured, but that doesn’t mean they can afford to see a doctor. 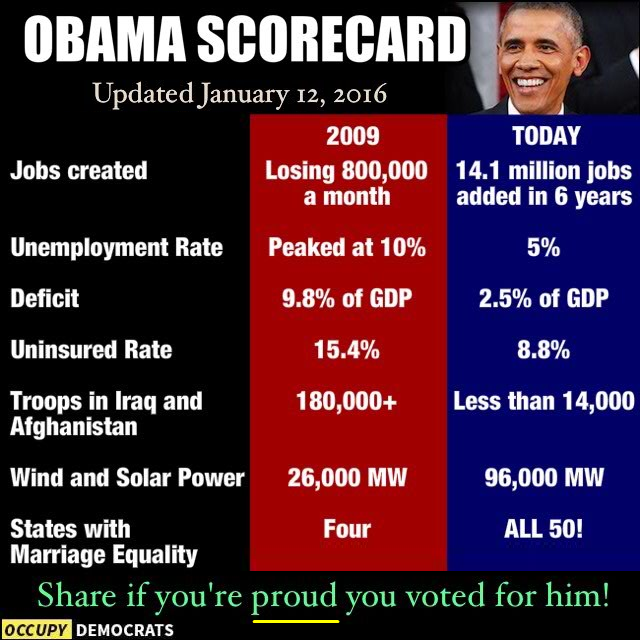 This meme below is a more jaundiced view of the Obama years. I don’t know that it’s ‘fair’, but the numbers are correct. To present these numbers without a context of just how deep a hole we were in when Shrub headed for Texas is probably not fair. Let’s face it–if you’re Barack Obama and you’re assuming the Presidency in January 2009, you’re inheriting the worst economy since the 1930’s. You’re going to have lots of people on food stamps. You’re going to see federal debt go up–Bush’s tax cuts and the wars are a big factor, but a whole lot of people stopped earning middle class wages (and thus stopped paying middle-class federal taxes). A somewhat more jaundiced view of Obama’s presidency. The Federal debt and food stamp numbers reflect an economy in structural depression. The numbers in the chart above that are most disturbing (at least to me) are the cost of health insurance (which under the ACA virtually everyone has to purchase), labor force participation (something I’ve written about a great deal), median family income (by one count the middle class has gone from being 61% of America to 42%) and student loan debt. Young people with big student debt are not going to become homeowners, are going to put off starting a family, and are going to be trapped in terms of the sorts of jobs they can do. Big student debt, coupled with high insurance costs and large medical deductibles, are going to keep lots of people from consuming enough to keep the economy going. As I contemplated how to finish this article, news came in that the Dow was down another 400 points this AM. The stock market has stayed juiced over the better part of seven years by shenanigans like corporate buy-backs of stock, which support higher prices. And thanks to quantitative easing and negative return rates on T-Bills, people who (like me) would be reluctant to put everything in Wall Street have to do so because there’s no return on savings. If interest rates for CD’s and regular deposits had stayed at levels consistent with the past 30 years prior to the Lehman crash, I’d probably have about a couple thousand extra dollars. And the market has been gamed since 2009 in other ways. Do you know about the Plunge Protection Teams? Google Plunge Protection Teams, and you’ll see that the hoariest of conspiracies have been laid out by economic journalists writing about their increasing attempts to keep the Dow afloat. But it isn’t just the foil hatters who are writing editorials about a coming crash anymore. When Wall Street’s favorite cheerleader network CNBC has an editorial that says “A recession worse than 2008 is coming“, one needs to prepare. And stop with the cheerleading.